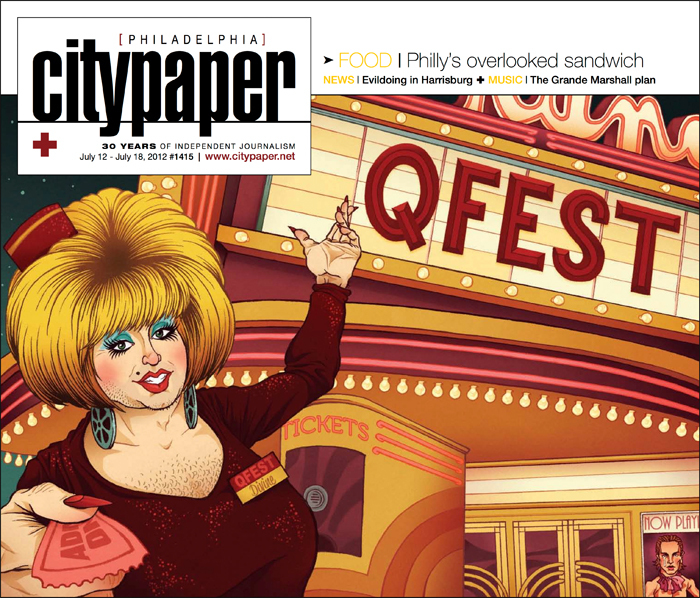 I was contacted recently by AD Reseca Peskin to do another cover for the Philadelphia City Paper. The last two covers I did for the City Paper, the People Who Died 2011 and the Urban Farmer's Almanac, were a blast so I jumped at the chance to do another. QFEST is Philadelphia's annual GLBT film festival with over 100 GLBT films from around the world. For the cover about the festival, Reseca wanted an old fashioned movie theater with a big drag queen in the ticket booth. 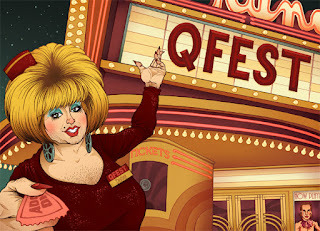 I worked up a few variations on the idea with my favorite image being the one with the drag queen (named Divine in homage to John Waters) right front and center welcoming the viewer to the festival. I had a great time researching and finding reference for the theater facade and drawing everything on Divine from the sequins to the wig to the chest hair. And I even ended up giving lettering a shot! Thanks again Reseca and City Paper for a fun, fabulous gig!